From the left, Prof Zhimeng ZHUANG, QNLM Deputy Director; Dr. Xu ZHANG, QNLM and Dr Annie Foppert, CSIRO CSHOR, both receiving 2nd prize; and Prof Jinming SONG, QNLM Deputy Director (photo courtesy of QNLM). 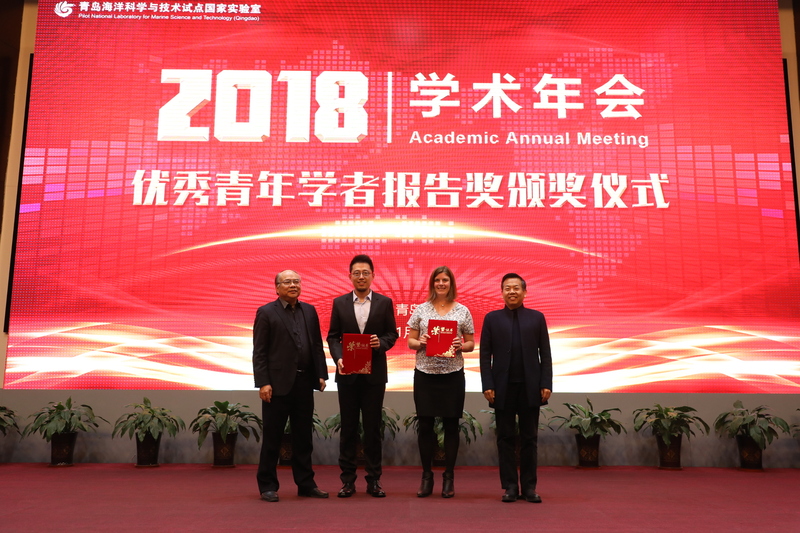 Congratulations to Dr Annie Foppert on winning second prize for her presentation at the Qingdao National Laboratory for Marine Science and Technology (QNLM) Academic Annual Meeting Young Scholars’ Forum held in Qingdao, China last week. Annie’s talk was titled, ‘Hot spots of eddy-driven transport across the East Antarctic slope’. The prize is 6,000 YUAN (~AU$1,200). The Annual Meeting was held on 10 and 11 January 2019. QNLM invited many young scientists from QNLM partner organisations both in China and internationally to submit a presentation to the Forum. The presentations were of a high calibre across a broad range of ocean science disciplines. Our staff also took the opportunity to tour the wonderful facility at QNLM and to attend a banquet in honour of CSHOR’s visit to Qingdao. CSHOR staff received a friendly and gracious reception at QNLM.